ARS studies have tied a new species of Candidatus Liberibacter bacteria to zebra chip (ZC) disease. Photo courtesy of Joseph Munyaneza, ARS. 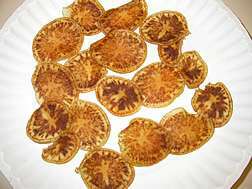 (PhysOrg.com) -- Studies tying a new species of Candidatus Liberibacter bacteria to zebra chip (ZC) disease in potato should speed efforts to better protect the tuber crop from costly outbreaks. Zebra chip is so-named because afflicted tubers form dark, unsightly stripes when they’re cut and fried to make chips or fries. However, eating them poses no consumer danger, according to Joseph Munyaneza, an Agricultural Research Service (ARS) entomologist who’s studied zebra chip since its detection in southern Texas in 2000. The disease, which has spread to Arizona, California, Nevada and other western states, has caused millions of dollars in losses. In 2007, an ARS-led team completed studies identifying the potato psyllid, Bactericera cockerelli, as an insect that transmits ZC. Then, in early 2008, New Zealand researchers, followed by University of California-Riverside scientists, announced their discovery of genetic evidence suggesting that a new species of Candidatus bacterium causes ZC. According to Munyaneza, with the ARS Yakima Agricultural Research Laboratory in Wapato, Wash., potato growers had been spraying their crops with insecticides to prevent psyllids from transmitting ZC. But until the 2008 discovery, they didn’t know what actually caused the disease—only that it correlated to psyllid feeding. Now, with evidence pointing to a Candidatus species, growers have more information to go on. For example, testing psyllid populations for ZC at known overwintering sites could give growers located at the insects’ summer migration destinations early warning that potato crops there could be in danger of infection. Predicting psyllid migration could also help time the use of natural enemies. Munyaneza and colleagues’ current studies include examining whether altered planting dates could diminish ZC’s severity. For example, 90 percent of potatoes planted in mid-December were infected with ZC by harvest in April, versus 25 to 30 percent infected when planted in mid-January or mid-February and harvested in May. Read more about this research in the October 2009 issue of Agricultural Research magazine.